As I mentioned in my CFHS blog post on July 27th, the Southwest Indian Detour Couriers were considered a walking information desk. They had to be conversant with all the flora and fauna in the West and Southwest. This would include knowing about edible and useful plants. While I was musing about what they might tell the “Dudes” about plants that would help them survive should they get lost in the desert, I was watching the birds flitting among the cattails in Yellow Jacket Creek in our back yard. During the previous week we had torrential rains and hail in Southwest Colorado. Bird nests that were once high among the cattails were now submerged or dipping into the water. Other than to shelter birds, provide roots for our resident muskrat and beaver, or grace a long necked vase, what good is a clump of Cattails? Here’s what I found: Indians used the flowering heads as a cure for diarrhea. The starchy substance mixed with animal or fowl grease was used to heal burns. The leaves were used for chairs and mats. Rootstock is edible and can be dried and ground into meal. The sap was prized as candy. 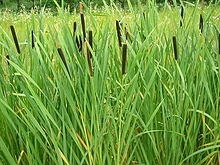 The down of the Cattail was used to stuff pillows and mattresses or as fire tinder. Nothing of the plant went to waste. Enough musing about cattail stuffing for the dog beds, it was time for lunch. We’re trying to eat more salads so I sprinkled on the garnishes to encourage my meat and potatoes husband to finish his side salad. Along with a sparse sprinkle of real bacon bits, I used Watercress. I knew that in 2010 the University of Southampton found that consumption of watercress may inhibit the growth of breast cancer. What are other benefits of Watercress? Here’s what I found: Watercress is considered an excellent food for people with deranged mind. [note to self — get more watercress.] 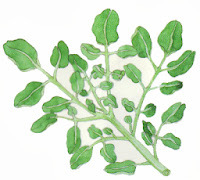 Watercress is often recommended for children to make them strong. Leaves or juice can be applied to freckles, pimples, or spots on the face at night and washed away in the morning with beneficial results. [note to self — get lots more watercress.] Mixed with vinegar, the juice is thought to be good for drowsy feelings and lethargy. Plus, as mentioned in the Talmud, vinegar and watercress is able to stop bleeding. Indians used the plant for liver and kidney issues, and to dissolve gallstones. Still flourishing in our backyard is the white parachute seeds of the Dandelion. 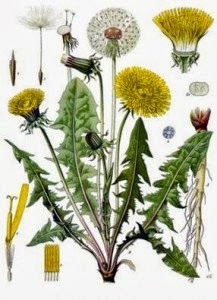 Considered a weed by most, the dandelion is one of our most common herbs. Watching the wind scatter the seeds, I'm reminded that Ralph Waldo Emerson said "a weed is simply a plant whose virtues have not yet been discovered." According to herbalist Gregory Tilford, the dandelion is one of the most complete plant foods on earth. Apparently, it has all the vital nutrients in a single source and in quantities that the body can easily process and fully absorb. This would definitely be a survival food source. Indians used the leaves for their medicinal as well as cooked with fat meat, a good source of Vitamins A and C. Root tea helped with yellow jaundice, liver, kidney complaints, and heartburn. Fresh young spring leaves are still used in salad and wine is made from the flowers. The flowers are also used for wine and beer. Now that I've heard of, but never tasted. The dried, roasted, and ground root is used as coffee. Have you ever had dandelion coffee? Relegating a plant to weed status is definitely in the eye of the beholder. Every time we traveled the interior of Mexico, we watched men chop down the Bird of Paradise plants in ditches and drainage areas and pile them to be burned. In Texas, we paid a high price for these decorative "weeds." The flowers, leaves, and stems can be dried for tea. 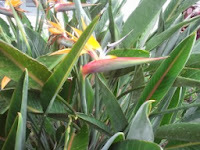 I suppose not many folks know that Bird of Paradise tea is a gastrointestinal tract medicine that is astringent and anti-inflammatory. A poultice is soothing to rashes, stings, and bites, plus is beneficial in relieving poison ivy and chemical sensitivity rashes. One man's weed is another man's curative. 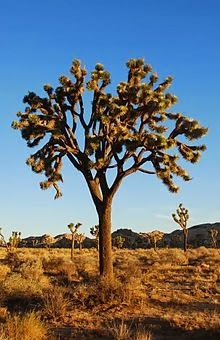 You’ve probably seen the long-armed, scraggly Joshua Tree and wondered what good are they besides being used as fencing or thorny reminders of their presence. They were used as fuel for ore-processing steam engines. The Indians made a red dye from the red rootlet for baskets, but could they eat any of it? Yes, after roasting, the flower bulbs can be eaten hot or cold. They are so sweet, they are often given to children as candy. The more I explore herbal medicine of the American Southwest, the more I'm impressed with the information the Southwest Detour Couriers had to learn. Their knowledge included herbs, wild growing plants, as well as the medicinal value of trees such as the Cottonwood, Aspen, Balsam Poplar, and the Willow. I wonder if we traded down instead of up when we abandoned the primitive for the modern. I wonder how much plant and herb knowledge has been lost because it was old-fashioned. Until the 27th of October, try a splash of pinon nuts on your salad. Thanks for such a neat and informative post! I happen to think the same as you in wondering if we traded down the primitive for the modern. I wonder what all we could have learned from these couriers. I can only imagine the wealth of knowledge these people stored in their heads! Thank you so much for sharing your comments. I apologize for taking so long to answer. I went to the hospital on the 25th for a routine colonoscopy and ended up staying for full blown cardiac arrest! What a week! I'm hoping that during my next trip to Santa Fe, I will be able to access some of the training materials they actually used. That would be fascinating. Hope to see you online next month. Thank you for this most informative post! I had no idea of all the uses for the many different plants. I know one thing, Watercress, watch out! I am about to start loading up on the stuff....Thanks again! Hi Melanie, good to see you. It is hard to believe that this information is a mere scratch on the top of the iceberg. I'm sure increasing my intake of Watercress, too. I've read about so many things that God built into the plant system that I'm going to look for a book I saw years ago about Biblical plants and their current benefits. The value of that resource went right over my head at the time. Amazing! Thank you so much for sharing this information about edible and useful plants. Like you, I wonder how much plant and herb knowledge has been lost because it was old-fashioned. Newer isn't always better! Hey Britney, yes it is so amazing. You are most welcome. While I was recovering from heart surgery this past week, I talked with the nutritionist about some of salad and fiber I now must seriously eat. She is a naturalist and I learned a lot more about the "old" foods that are helpful after a heart attack. Viva the green stuff! Hi Maxie, thanks for stopping by. I have that cookbook, too! In Austin they use a lot of Dandelion greens year round and they are very good. My husband, Jerry, calls them the fru-fru restaurants. Its the young spring leaves for salads and The leaves are cooked in animal fat. We've moved away from moderate use of animal fat, too. I was amazed that the tea is used in treating heartburn, fatigue, skin allergies, joint inflammation, colon stability, plus uric acid kidney stones. I'm going to look more closely at getting some tea. We have ignored God's provisions so long. It's such a shame. Loved this informative post! Thanks for sharing. What is the willow used for? Thanks! Hi Sally, thanks for commenting. The leaves and bark are an accepted remedy for aches and fever. They provide a temporary relief for stomachache, headache, and other body aches. The willow bark extract, Salicin, is a forerunner to our present day aspirin. Interesting post! I love learning what herbs help us. I drink roasted dandelion root tea...have done so for years....it is like coffee substitute to me! What is good for pain?? I have back issues. Hi Jackie, glad to see your comments. As soon as the doctor releases me from the sudden heart attack I suffered on the 25th, I want to try the dandelion root tea. Out here in Southwest Colorado, I hear a lot about Yerba Mansa for spasm, arthritis, acute injury with pain, and muscle pain. The competitive cyclists are big on Yerba Mansa, Verbena, and Peppergrass. We have so many cyclists pass the house on their rides, I should keep some tea on hand. Their chase cars usually use our drive outside the fence as a meeting place. herbs, plants, & trees, broken down as to availability in each area of the U.S.. I'm sure we would be healthier if we availed ourselves of the use of these things. Years ago - man lived off of the land, something that we do a limited amount of now. Hey Bonnie, so good to hear from you. I wish I could find the info all in one place. I drew from ten different books. The day before I went into the hospital on the 25th, I found Herbal Medicine of the American Southwest: The Definitive Guide. Fascinating reading and had so much more I could have added to this post. The deadline for my post for the 27th is the 20th, so this story was already put-to-bed. Right now, I'm reading Indian Doctor: Nature's method of curing and preventing disease according to the Indians. According to the compiler, Nancy Locke Doane, her grandmother used this book second to the Bible in raising her twelve children. It reminded me that my grandmother called recipes "receipts" and so did my mother. I've never heard of some of these conditions such as Gleet, Whites, King's Evil, Gravel, and Quinsy. If I find more comprehensive sources, I'll send you an email. Maybe some of our comments may know a source.